Duplicity doesn't come with any Customizer options for changing the fonts. You'll need to do a little coding if you want to change them. This guide will walk you through how to add different Google fonts to the Duplicity theme. 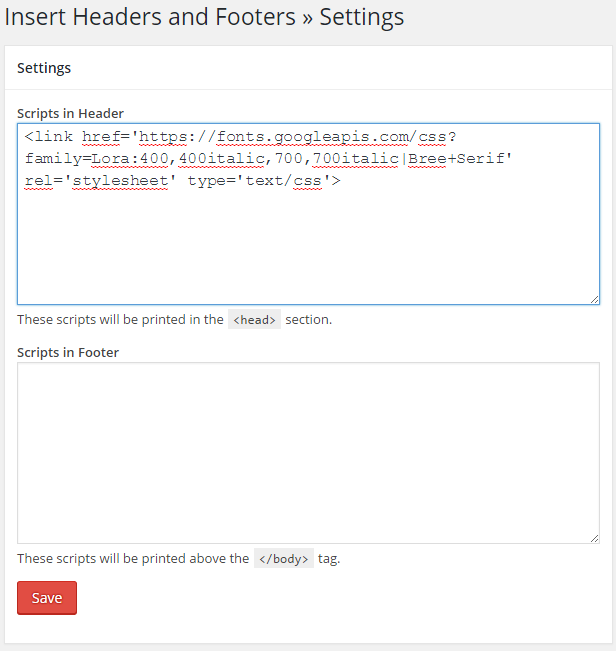 Install and activate the Insert Headers and Footers plugin by WPBeginner. We'll be using this to add the Google fonts to the <head> area of the site. After you activate it, there will be a new settings menu in Settings > Insert Headers and Footers. We'll come back to that. Navigate to google.com/fonts to start picking and choosing the fonts you want to use. When you've found one you like, click "Add to Collection" to add it. For this example, I'm going to be changing the main paragraph text to Lora headings (site title, post titles, and widget titles) to Bree Serif. 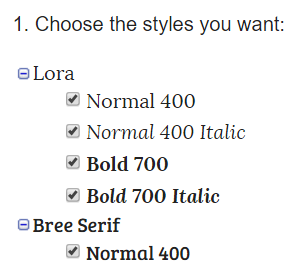 Once you've added all your desired fonts to your collection, click "Use" at the bottom of the page. This allows you to have paragraph text that looks good normal, italicized, bold, and bold/italicized together. Yours will look different depending on the fonts and styles you chose. Go ahead and copy that to your clipboard. Don't close this tab yet though - we'll be back here later. This is where the Insert Headers and Footers plugin comes in. 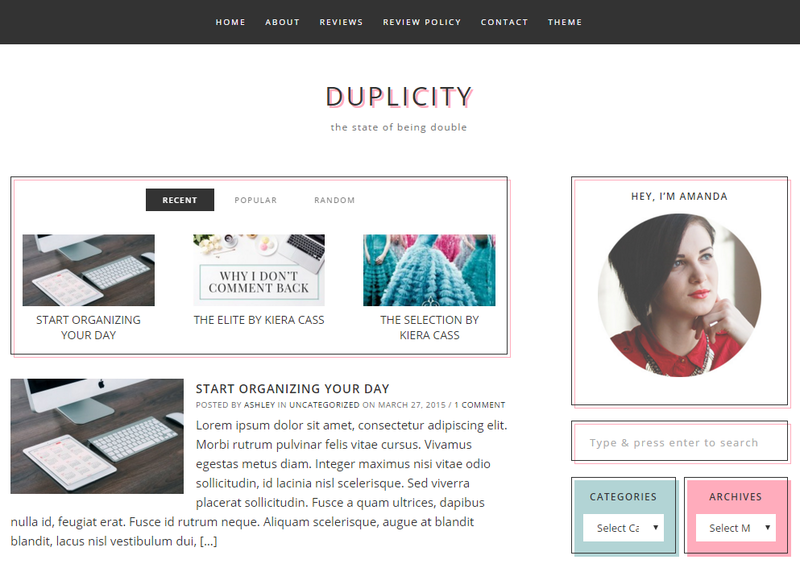 Back in WordPress (again, don't close your Google Fonts tab yet! ), go to Settings > Insert Headers and Footers. Find the box called, "Scripts in Header" and paste your Google Fonts code in there. Then save. At this point, the Google Fonts code is added to your header, but none of the fonts on your site have actually changed yet. That's our next step! Knowing the HTML thing you want to change (just post titles, just headings, all text on the page, etc.). Knowing the name of the font you want to change it to (this is where our Google Fonts tab will come in handy again!). All the code we discuss below needs to go in a custom CSS area. There's one built into WordPress in Appearance > Customize > Additional CSS. Paste all the code in that box. Then the name of the font goes inside the curly braces. 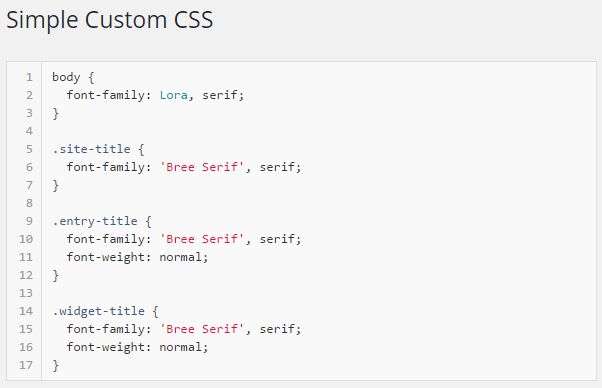 But remember, I want my headings to use the Bree Serif font instead. So let's go ahead and add that in. Remember to replace your font-family line with your own font name! Those are just examples. You'd pick one to use for each thing you edit. You must have also selected that style on the Google Fonts page. After all that, let's see how the new site looks! The differences are subtle, but they're there! You can particularly see it in the site title. Want to change all headings on the page? Including site title, post title, widget titles, and more? If you want all headings to have the same font, then it doesn't make sense to edit them one at a time. Here's how you can do them all in one fell swoop!